Ptichye Moloko was another eastern European treat that I received as part of my free sample of Bocandy, a new subscription treat service that specializes in international candy. 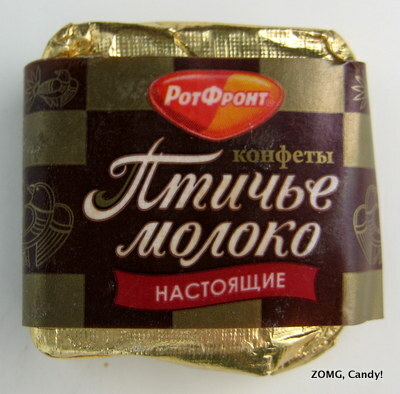 According to the folks at Bocandy, “Ptichye Moloko” means “Bird’s Milk” in Russian and is so named because “Bird’s Milk” is a Slavic idiom that means an unattainable gift (when was the last time you saw milk coming from a bird?). The Pitchye Moloko was a squashed cube (so not actually a cube) consisting of a chocolate shell around a snow-white whipped center. Mine had melted a bit before arriving, so they weren’t their most photogenic by the time I got them. 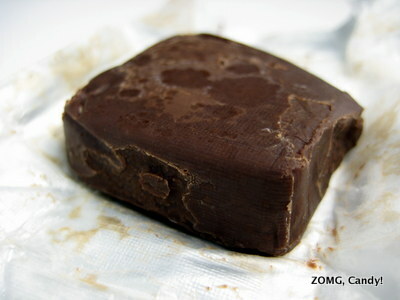 That chocolate shell was incredibly sweet and a little crumbly. In fact, I caught some crunchy graininess to it, I think because some of the filling’s sugar had crystallized onto the chocolate. At first bite, the shell was way too sweet and just tasted like sugar to me. After my tastebuds were able to adjust from the original sugar shock and awe, however, some nice coconut and cocoa notes came through. The marshmallow filling at the center of the Pitchye Moloko was great. 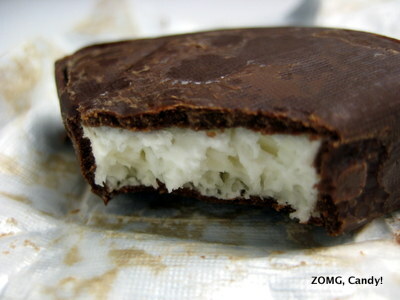 It was soft and fluffy in texture, and though sweet, also had a lovely dairy whipped cream note to it. I hated the first sugarbomb bite, then loved the rest after my tastebuds recalibrated. An OM. As noted on Monday, you can get a free Bocandy sample if you pay $3.50 shipping. Bocandy is also currently running a giveaway of 3 year-long subscriptions.